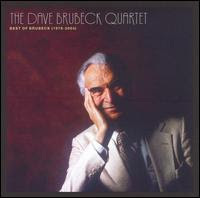 JazzWrap | A Jazz Music Blog: Dave Brubeck: After "Time Out"
So you finally own one of jazz histories most important albums, Dave Brubeck's Time Out (Columbia)--Now What? Well if you enjoyed this lovely piece of modern jazz from a master at the piano, might I suggest you go further, my friend. Dave Brubeck recorded a number of wonderful records following Time Out, two of which are my favourites, Live At Carnegie Hall (Columbia) and The Brubeck Quartet with Jimmy Rushing (Columbia). Live At Carnegie Hall is a smokin' set recorded after a return from the groups 1963 European tour. There are a number of standards mixed in with the usual crowd favourites. The evening ends with pulsating renditions of "Blue Rondo a la Turk" and "Take Five". Brubeck with Jimmy Rushing is fantastic pairing of the Blues/R&B legend with the hottest jazz quartet of the day. This is a sweet, mellow and all together solid session that very few people still don't know about. Since Dave Brubeck is still recording albums today you might want to try the recently released The Best of Brubeck 1979 - 2004 (Concord Jazz). This two disc set covers the time period after Dave left Columbia Records and features some excellent tracks that show he hasn't lost that rhythm. The Best of Brubeck does have a few newer versions of classics tracks like 'Take Five', "St. Louis Blues" and "Yesterdays" but its great to hear how these are translated years later from their original sessions. There are also some killer live versions of "Cherokee" and "Cassandra," originally on a live album entitled London Flat, London Flat (Concord Jazz). The album Time Out cast a large shadow over jazz as well as Brubeck's other recording but it is important to note that he still does some unbelieveable work that will someday sit along side that classic piece of jazz history. If you've been wondering what to do after you've bought Time Out, I hope you take the time to give the aforementioned a spin. Worth hearing a living legend who is still reaching the summit of his elegant career. If you still don't own Time Out, what are you waiting for? Find out why we think Time Out is important.